Conversion • It's a step toward turning Bangerter into a freeway. 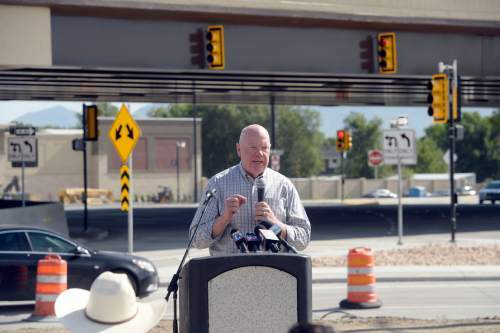 Al Hartmann | Tribune file photo The freewaylike interchange at Bangerter Highway and Redwood Road is now open. Bluffdale Councilwoman Heather Pehrson throws some of the last of the orange construction barrels to workers to open the intersection Thursday, July 16. Al Hartmann | The Salt Lake Tribune The freewaylike interchange at Bangerter Highway and Redwood Road is now open. Elected officials from Bluffdale and Riverton helped UDOT workers remove the last of the orange construction barrels Thursday, July 16. 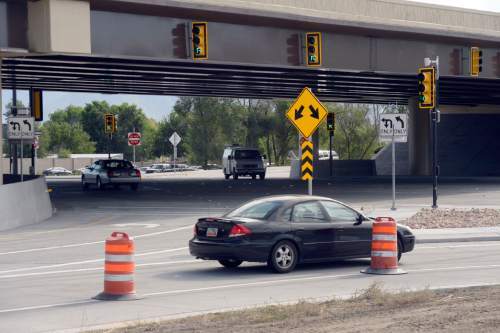 Al Hartmann | Tribune file photo The freewaylike interchange at Bangerter Highway and Redwood Road is now open. 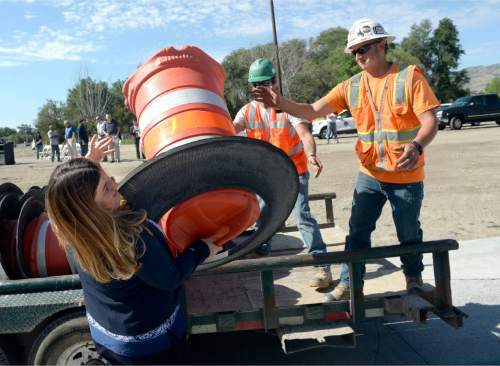 Elected officials from Bluffdale and Riverton helped UDOT workers remove the last of the orange construction barrels Thursday. July 16. Al Hartmann | The Salt Lake Tribune Sen. Howard Stephenson, R-Draper, speaks at the celebration to mark the completion of the new freewaylike interchange at Bangerter Highway and Redwood Road on Thursday, July 16. Al Hartmann | The Salt Lake Tribune The freewaylike interchange at Bangerter Highway and Redwood Road is now open. Bluffdale Councilman Ty Nielsen helped workers remove the last of the orange construction barrels on Thursday, July 16. Al Hartmann | The Salt Lake Tribune The freewaylike interchange at Bangerter Highway and Redwood Road is now open. Bluffdale Councilman Ty Nielsen, right, and Sen. Howard Stephenson, R-Draper, helped workers remove the last of the orange construction barrels on Thursday, July 16. 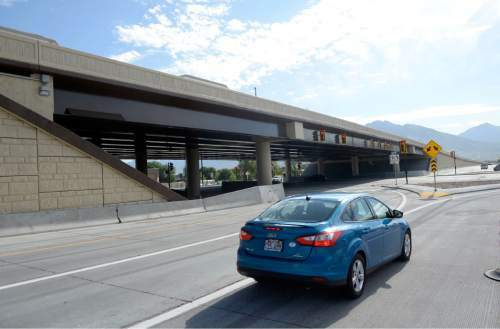 Al Hartmann | The Salt Lake Tribune The freewaylike interchange at Bangerter Highway and Redwood Road is now open. Sen. Howard Stephenson, R-Draper, helped workers remove the last of the orange construction barrels Thursday, July 16. 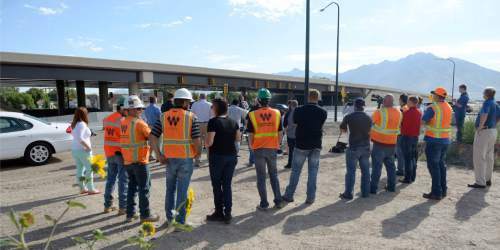 Al Hartmann | The Salt Lake Tribune UDOT and construction workers watch official opening of the freewaylike interchange at Bangerter Highway and Redwood Road. 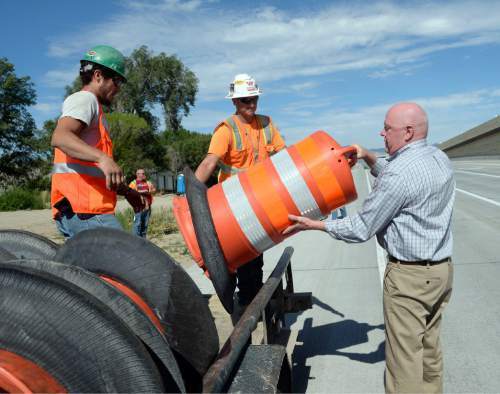 Elected officials from Bluffdale and Riverton helped UDOT workers remove the last of the orange construction barrels Thursday, July 16. 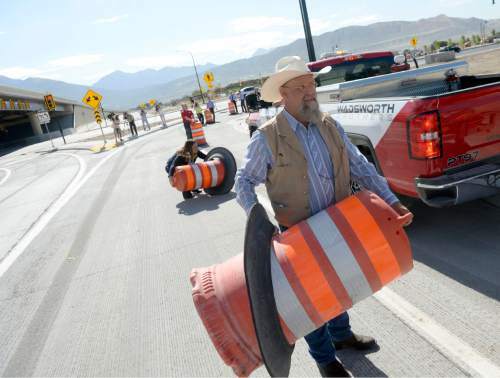 Instead of cutting a ribbon, Riverton and Bluffdale officials lined up Thursday to remove the last orange construction cones at a project that converted the intersection of Bangerter Highway and Redwood Road into a freeway-like interchange. "This will save us" in handling traffic, Bluffdale City Council member Ty Nielsen said with a grin after he heaved an orange cone onto a truck. 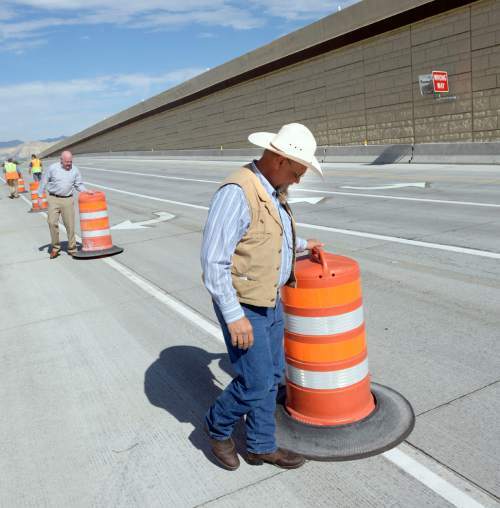 It was part of a ceremony completing the $44.6 million project that began in June 2014 and was designed and built by Wadsworth Brothers Construction for the Utah Department of Transportation. The new interchange carries Bangerter Highway over the top of Redwood Road, with ramps connecting them. Beneath the bridge is a "single-point urban interchange" with one set of traffic lights controlling traffic on Redwood and the freeway ramps. It should greatly smooth traffic at one of the state&apos;s busier intersections, which averages 71,805 vehicles a day  44,585 on Bangerter and 27,220 on Redwood. UDOT built a similar interchange on Bangerter at 7800 South in West Jordan and plans to slowly convert Bangerter into more of a true freeway over time by converting more key intersections into interchanges. The new interchange, on the boundary of Riverton and Bluffdale, "looks beautiful and will provide a gateway to both of our cities," said Bluffdale City Council member Heather Pehrson, adding that it also will open up more nearby areas to development. Riverton Mayor Bill Applegarth said it will improve safety, economic development and traffic flows. But when UDOT announced the project, he said, "it brought fear … how on earth were they going to build that bridge without severe problems" with traffic? He praised UDOT and Wadsworth for coming up with a system of temporary roads and signals that kept the intersection open and moving during construction. "The flow has gone extremely well, thanks to the innovation." Nathan Lee, director of UDOT Region 2, said the changing temporary roads reduced congestion by a third from what otherwise would have been expected during construction.